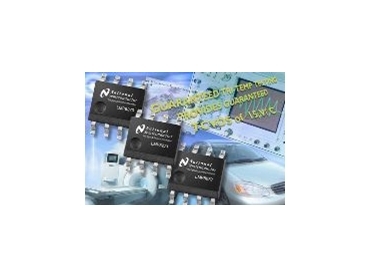 Offset voltage of less than 250&mu;V.
NATIONAL Semiconductor, represented in Australia by Arrow Electronics , has released three high common-mode difference amplifiers. They are designed for industrial, commercial and automotive applications. The amplifiers are capable of accurate current sensing measurements in products such as battery charging and discharging for notebook computers and mobile phones and fuel injection control. The bidirectional LMP8271 measures charge and discharge currents at high common mode voltages typically found in precision applications. It uses an external reference voltage to set the voltage defining a zero-current condition. An LMP8271 output voltage greater than the external reference voltage indicates a charging current condition while an output voltage below the external reference voltage identifies a discharging current condition. Accurate bidirectional load current measurements are achieved when monitoring the output with respect to the reference voltage. The LMP8270 and LMP8272 are unidirectional, fixed-gain, differential amplifiers. They detect, amplify and filter small differential signals in the presence of high common mode voltages. For the LMP8270 and LMP8271, the gain is fixed at 20. For the LMP8272, the gain is fixed at 14. They have a -2V to 27V input common mode voltage range and a supply voltage range of 4.5V to 5.5V. They also function over an extended common mode input voltage from -5V to 36V, enabling high-side current sensing where the input voltage range far exceeds the supply voltage range of 5V. The offset voltage of the LMP8270/71/72 is less than 250μV and the offset drift is less than 15μV/ºC. This allows accurate small input differential signal conditioning and minimal voltage offset error through the entire temperature range. The extended operating temperature range of -40ºC to 125ºC allows the amplifiers to be used in extreme conditions, such as those found in automotive and industrial applications.